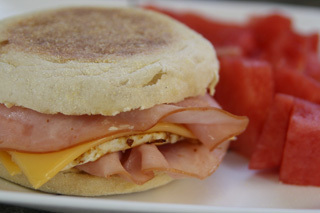 Meals in 15 Minutes or Less - Breakfast 4: English Muffin Sandwich! As I've mentioned before, we never really ate fast food or boxed meals growing up. Most of the time, it was homecooked meals. However, on the rare occassion when we were traveling and we needed something quick to eat, we may stop at a fast food restaurant for breakfast. I was always deeply surprised by how distasteful the breakfasts were. For a while, I even disliked ordering breakfast foods at restaurants because I found them to be so inferior to the homemade foods my mom cooked up. When I decided to reinvent the fried egg on English muffin breakfast sandwich (aka McMuffin), I debated what kinds of ingredients I should use. To use real cheese or "slime" cheese; that was the question! Assemble all your ingredients on the counter. Begin by placing the English muffin in the toaster on medium. Then, melt some margarine in a small frying pan on medium high heat. 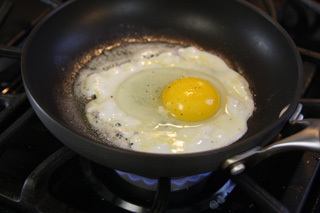 Add the egg and let cook for 2-3 minutes on each side. Put margarine on each half of the English muffin. 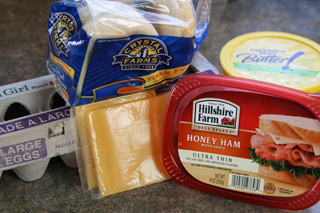 Then place one slice of ham on each half and top that with each slice of cheese. 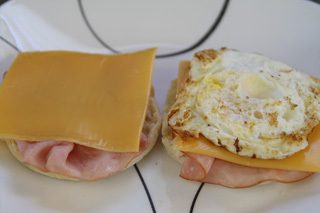 Finally, put the egg on the sandwich and put the two halves together. This Meal in 15 minutes or Less from fridge to plate will satisfy your morning hunger and take only a minimum amount of effort. Enjoy your tasty breakfast sandwich!